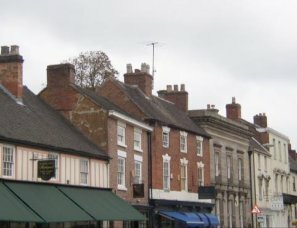 The Georgian style of building is the most common found in Ashbourne. However, look behind the facades and you will discover building features throughout the ages. The interactive building above will help you explore the many features you can find - if you look hard enough! 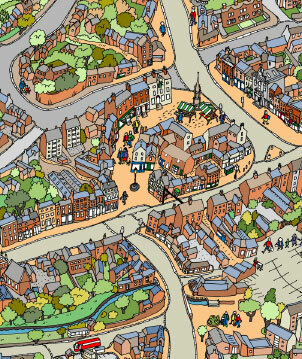 Research has been conducted in relation to the development of Ashbourne Market Place during the 15th and 16th Centuries. 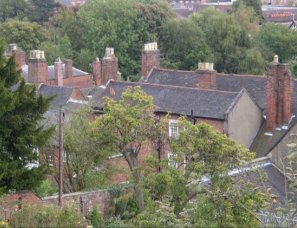 Details of this research, including dendrology studies of building within the market place are contained within this report. This report is published with the permission of the author, Anthony Short, Architect. 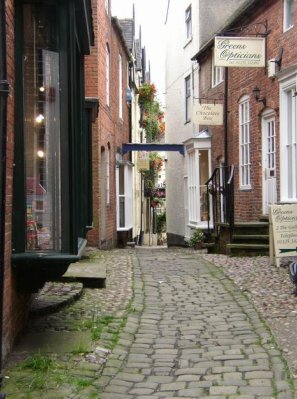 The predominant roof covering material used within the town is made of clay generally ‘Staffordshire Blue’ clay tiles with clay ridges. 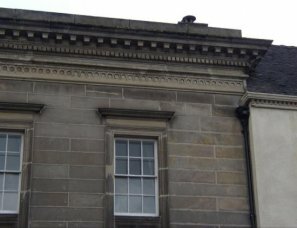 Many properties of ‘Georgian’ design have parapets to their eaves and stone coped gables. In these circumstances the roofs are partially hidden from view as was the intention. Properties which do not have parapets or stone coped gables have plain traditional eaves and verge details. 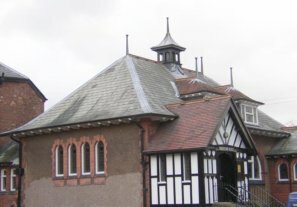 Buildings constructed in the late 19th century and early 20th century do display Welsh slate roof coverings. 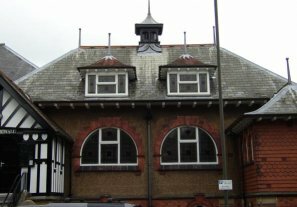 Their use may have been architectural but may also have been as a consequence of the relative ease of supply of Welsh slate throughout the country as a result of the expansion of the railway system. Roof hidden behind decorative cornice (Church St). Where rainwater goods such as gutters, downpipes etc can be seen, they are generally made of black painted cast-iron. Gutters are generally supported by ‘rise and fall’ brackets. 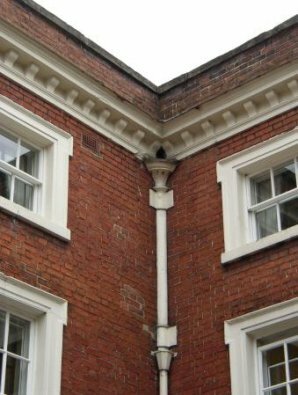 There are several examples of lead hoppers and downpipes around the town. Clergy Widows Alms Houses, Church St. The permanency and long term durability of stone buildings has a long history. 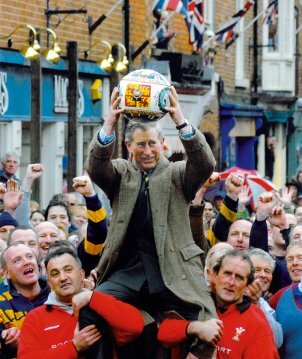 In Ashbourne the use of stone is secondary to the use of brickwork; however the most important buildings are constructed from local stone such as the parish church, the old grammar school and the alms-houses. Constructing such buildings in stone would have been an overt act of permancy anticipating the long term durability of these structures and time has proven this decision to have been a prudent one. 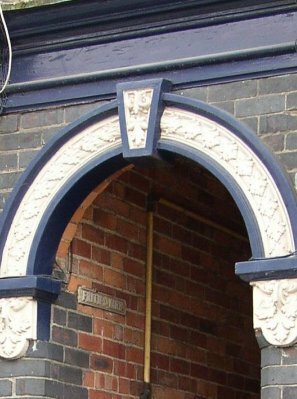 Following the predominant use of brickwork from the late 17th century onwards, stone was used only for decorative and structural details. 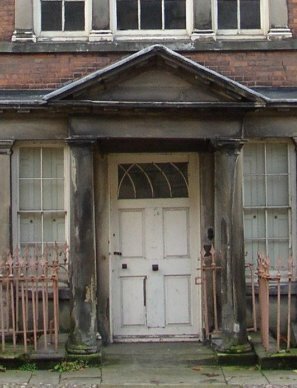 Apart from in 1760’s an imposing Neo-Classical house located opposite the old Grammar School and Compton House (now Lloyds bank in Compton) were built, however Compton House has stone on the front and not the sides and back. 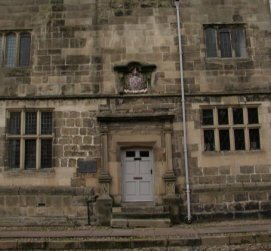 In the medieval period if stone was not used the main building material was timber-framing with lath and plaster infill. The landscape character around the town was well wooded and oak was easily available, and the pictorial view in c1550 appears to show a town of timber framed buildings. 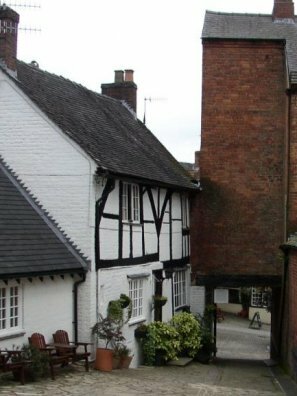 A typical sign of an old timber building is that each building having a gable facing onto the road. From the later 17th century onwards the vast majority have been lost, however some still exist today and can be seen from the outside and the full extent of surviving timber-framing is not entirely known and internal alterations to properties could reveal further remains. 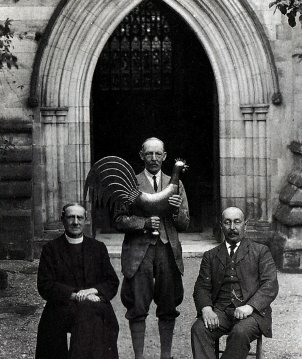 The Methodist Church, Church St.
Tiger Yard, off Victoria Square. The quality of the majority of the buildings in town the design of the door is clearly reflected. 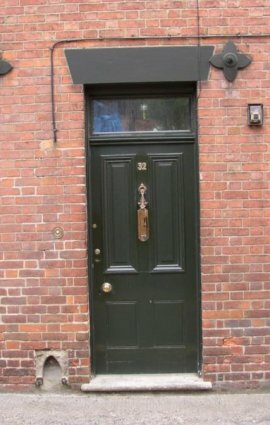 The front door is always the most important element and was treated in a decorative and architectural way. This provided a wide variety of different doors ranging from those that were clearly designed to impress and those, which all be it having elements of design, were less imposing in their treatment. 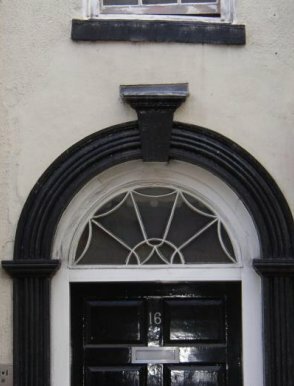 A frequent element is a semi-circular fanlight. This originated in the 18th century and provided a decorative and architectural way of gaining natural light to the hallway inside, as during the 18th and 19th century the doors were generally solid in construction i.e. no glazed panels. 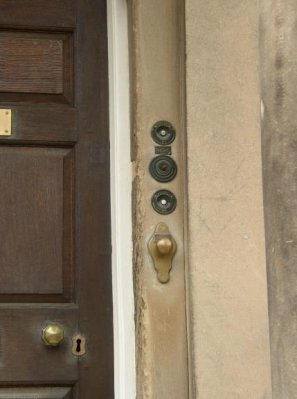 From the mid-late 19th century a change in design doors took place from having four panels instead of six. The reason is not entirely clear but it is possible that a slight reduction in the width of doorways, possibly associated with fashion allowed four panels to be more proportionally more acceptable than six. 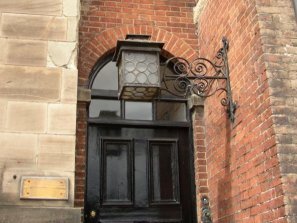 Also during this period the mouldings also became more robust and heavy and were required the semi-circular fanlight was replaced by a plain horizontal rectangular fanlight. 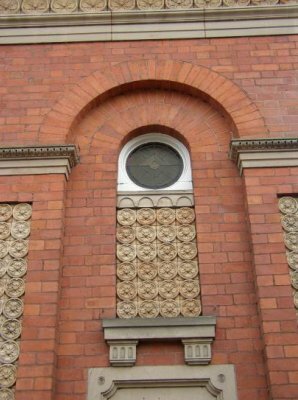 Within the town centre, there are examples of windows covering a period of nearly two hundred years. The prevalent window type found in town is the vertically hung sliding sash window. 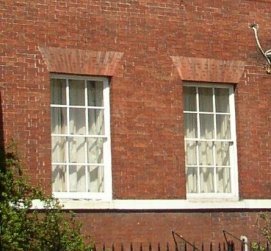 The sash window first made its appearance in England in 1680s and its appeal was instant and widespread and it quickly began to replace the former window cruciform window frames and the older stone framed windows. 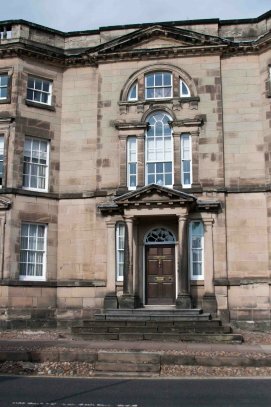 Almost every building within the town centre has examples of sash windows, varying in pattern and size and the earlier versions have from 8 x 8 panes of glass, however in the 1850s with changes to taxation on windows and glass, and advances in glass production, larger panes become more available firstly from 2 over 2 and finally to 1 over 1. With the larger panes of glass, “horns” need to be introduced into the window design to provide additional strength to the frame. Todays its normal to see windows frames, sashes, casements etc. finished in a white or light coloured paint. Research of old photographs clearly shows during the period of circa 1880 – 1920 that the mast majority were painted a darker colour. Although all the historic photographs are black and white it is clear that the finish paint colours are dark. 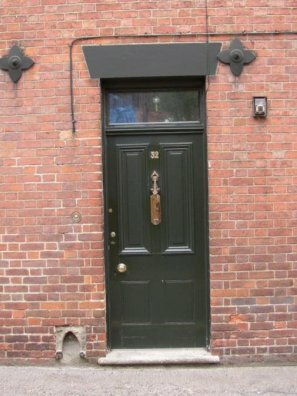 These cannot be confirmed but the palette of colours available in the later 19th and early 20th century for external paintwork where limited to black, dark blue, dark brown, dark blue, dark red and dark green – very similar to the traditional colours used for shop fronts and front doors. The preponderance of dark paint colours must have had a visual impact on the overall character and appearance of the town. It was only after the end of World War 1 and accelerated after World War II that the fashion for whitening windows was so widespread and popular. The Grey House with Venetian and Diocletian windows. 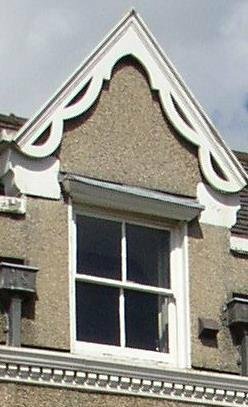 One of the architectural features found in a number of houses in Ashbourne are Venetian windows. 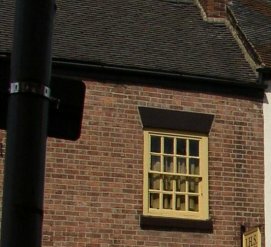 They were very fashionable around the 1760s and are to be seen at Pickford Houses in Derby and in Erasmus Darwin’s House by the Cathedral Close Lichfield. 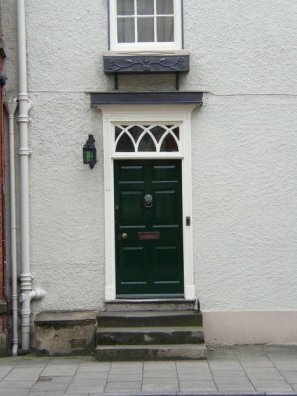 At Compton House, Ashbourne, they are either side of the main door. Hulland House in Church Street also has such a window at the rear. 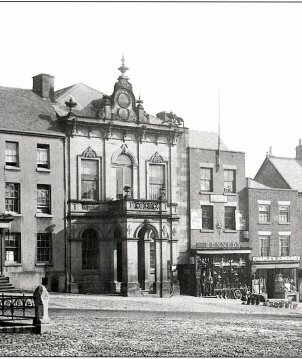 Prior to building Compton House Joseph Pickford did work re-fronting The Grey House for Brian Hodgson and The Mansion for Dr John Taylor, both in Church Street, Ashbourne. The windows at The Grey House and The Mansion House have Diocletian windows positioned above the Venetian windows. 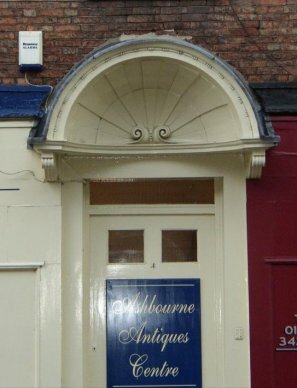 This combination of Venetian and Diocletian windows can be seen on another premises in Ashbourne, now the Vision Express shop in St John Street. 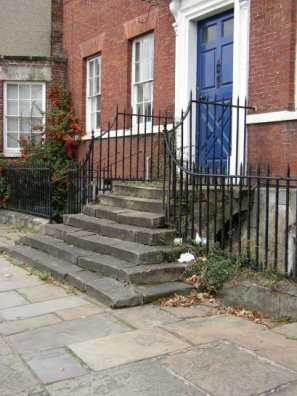 A number of properties on Church Street and some other properties have stone steps and handrails to their front doors. 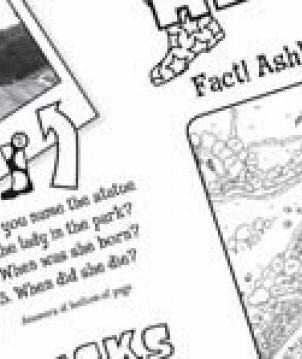 The reason for this is twofold, firstly the general topography of the land is sloping in a north-south direction and secondly many of the properties have basements or cellars that are only half buried. 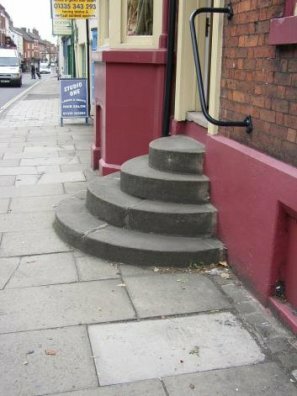 In order to achieve access to the front door, on the raised ground floor was to have stone steps. These steps allowed each building to form an impressive entrance and some are clearly more impressive than others. 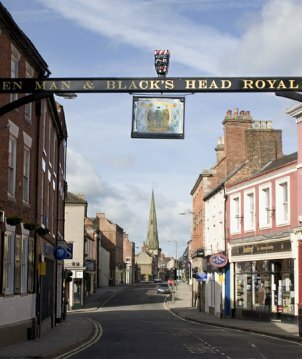 As a commercial town, Ashbourne has a large number of shop fronts. The vast majority of these appear to be insertions carried out at a later date than the age of the building which is not unusual. 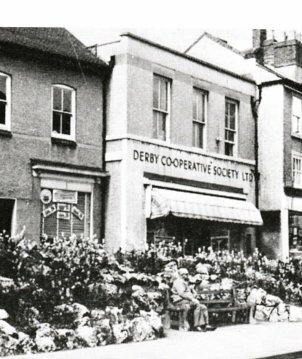 The variety and detailing of the shop fronts represents a fundamental part of the town’s character and appearance. 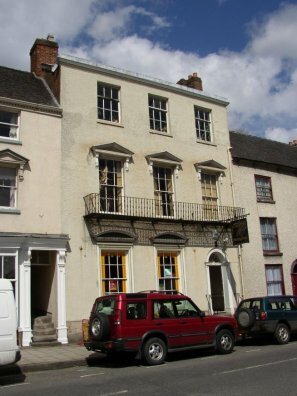 No 18th century shop fronts survive and only two or three from the 19th century and the earliest survival is the to the Cheddar Gorge cheese shop located in Dig Street which has projecting multi paned bay windows, decorative doorway with fanlight and cresting to the cornice. 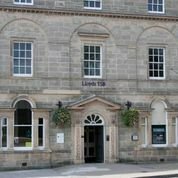 There is a large amount of decorative details which are not only of interest in themselves as historical survivals but are also important elements of the town which give its buildings a depth and attention to detail, that is seldom seen today. 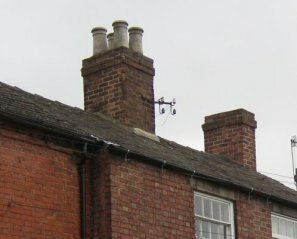 Virtually all buildings up to the 1960s had chimneystacks. 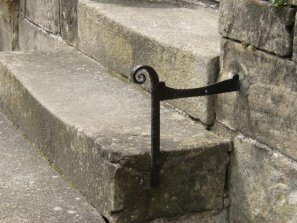 In the age of coal and timber burning, throughout the 17th to the early 20th centuries, they were a practical necessity and were an important element of any building or house. 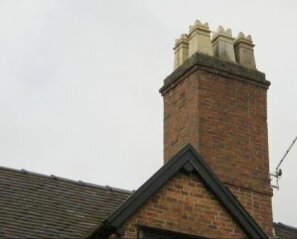 From the 17th century building designers realised that the necessity for a chimneystack could be integrated into the "design" of a house and that they could be decorative, architectural, elements in their own right. 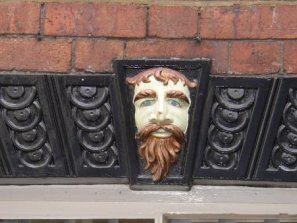 They are found on buildings throughout Ashbourne. They vary greatly in size, shape, form and detailing but the vast majority are constructed in brickwork, although a few stone examples can be found. The most prevalent type of pots are the plain, circular pot – usually of buff clay, and the square “pylon” pot which takes it design from Ancient Egypt and Greece.